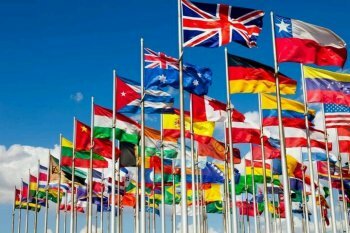 Call us or email us for Indivdual Country Flag Price. Or click here for link to request pricing by using our contact page. Nylon outdoor flags are made of 100% nylon fabric. They are acid dye printed, single-reverse in construction which means that the image is correctly reading on the front side, and in reverse on the back side. The flag is double needle hemmed and has a heading and grommets on the left side (hoist side). 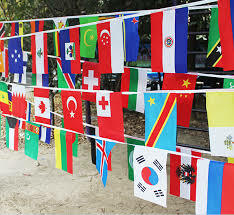 Nylon outdoor flags are made of 100% nylon fabric. They are acid dye printed, single reverse in construction which means that the image is correctly reading on the front side, and in reverse on the back side. The flag is double needle hemmed and has a 3" flat pole hem with leather attachment tabs on the left side (hoist side). Sewn nylon flags are those with simple stripes or very simple designs. They are double needle seamed and hemmed and made with 3" flat pole hems with leather attachment tabs. Made of 100% colorfast nylon fabric. Italy, Ireland, Mexico, Spain, France, England, Canada, Poland, Greece and so on. The most common size is 3' x5'. For more information on availabvle sizes, pricing etc., please contact us by phone or email..
Flags of Scotland and Wales, the Polish Eagle flag, etc. are also available. Contact us for more information and to make a purchase. Larger sizes of most flags are available by request.